DISCLAIMER: I am not a doctor nor a medical professional in any way. These posts are a diary of the specific case of my mother. Please consult with your doctor for medical advice. Well today's trip to the doctor went without a hitch. In and out of the shower with no trouble or drama. Hooray! At the doctor's office, we had a follow up discussion on her fainting spells. I told the doctor that I had begun giving Mom Gatorade with her pills in the morning. This was at the suggestion of a friend who's doctor friend said her fainting sounded like her electrolytes were off. Indeed, the prescription (Fludrocortisone) that she started back in January during her trip to the hospital was supposed to do just that. He said that the Gatorade would supplement the new pill which, if we were to up the dose, would have a side effect of swelling because of the water retention. This effort dovetails with her prescription (Midodrine) that is supposed to constrict her arteries to prevent the lightheadedness when she gets up rapidly. On the Alzheimer's subject, I mentioned that a different friend's husband is a Psychiatrist and has had success with Namenda — even in patients where the disease is advanced. My brother said she had never been on it, and he managed her care while I was out in California, but records with the doctor show that she has taken it and didn't tolerate it. But the symptoms that she exhibited that led them to discontinue it seem more inline with the fainting so he gave us a starter dose pack and we are going to try it again. Since I've been here, we've cut way back on other "mind adjusting" drugs (Paxil for depression and Xanax for anxiety) that she takes. With me around to keep her company and to take care of things, she's less depressed and anxious. 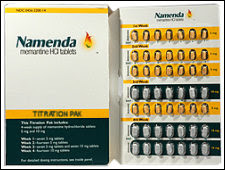 Less medication swimming around in her brain may make a difference on the efficacy of the Namenda, too. We'll see. At least we keep trying to make things better for her. I hope it works!